As expected, Strikeforce bantamweight champion Ronda Rousey (Pictured) will make her first title defense when she meets Sarah Kaufman on August 18th. 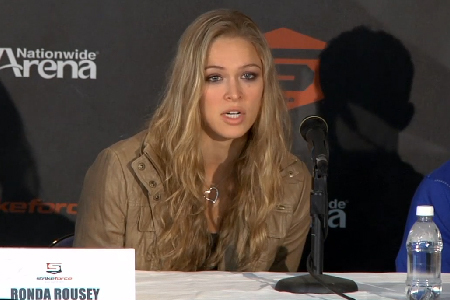 Strikeforce CEO Scott Coker confirmed the shootout during Tuesday’s conference call. Rousey captured the 135-pound crown by submitting Miesha Tate in the opening round of their heavily-hyped grudge match. The “Rowdy” one is perfect through her first five professional fights, with all of her scraps ending in 1stRound armbar fashion. Kaufman secured her next dibs status by posting a majority decision victory over Alexis Davis in the same March card. She has rattled off three consecutive wins since losing the title to Marloes Coenen in October 2010. Additional bouts will be announced for the lineup in the coming days. Tickets for the show go on sale this Friday. Showtime will broadcast the main card at 10PM ET/PT.